Preheat the oven to 350°F and toast the pine nuts until they are a nice golden brown, approximately 5-8 minutes. Peel and slice the ginger and shallots, slice the garlic and combine them into a food processor with the salt, toasted pine nuts, flaxseed oil and Thai basil leaves. Remove the stems from the kale and roughly tear the leaves apart into smaller pieces and add them to the food processor as well. Zest and juice both lemons, discarding any seeds and add the zest and juice to the food processor. Secure the lid of the food processor and blend all the ingredients together on high speed until they are all chopped up fine and resemble a pesto. Store pesto in a container with a lid in the fridge for up to 1 week, the pesto can also be frozen and thawed at a later date for use. 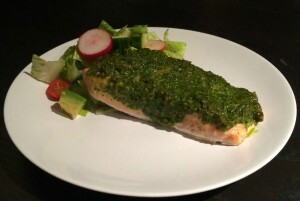 Serve pesto on top of chicken, pork, salmon or prawns.